Home / Santa’s getting ready…..
It’s only five more days until Santa’s big trip to deliver gifts. It was about time he got his Santa suit on! 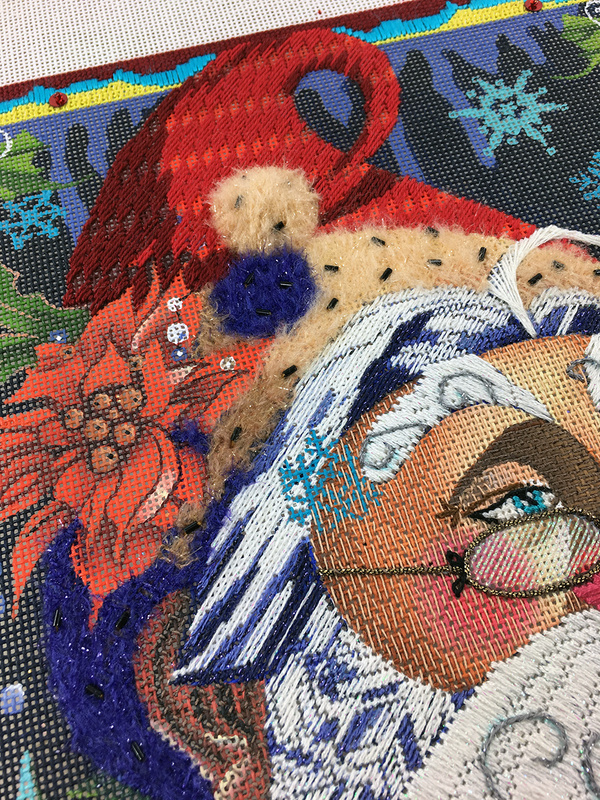 Yesterday was our last Mystery Class of the year and we had a lovely time hanging out and visiting while stitching on Santa. 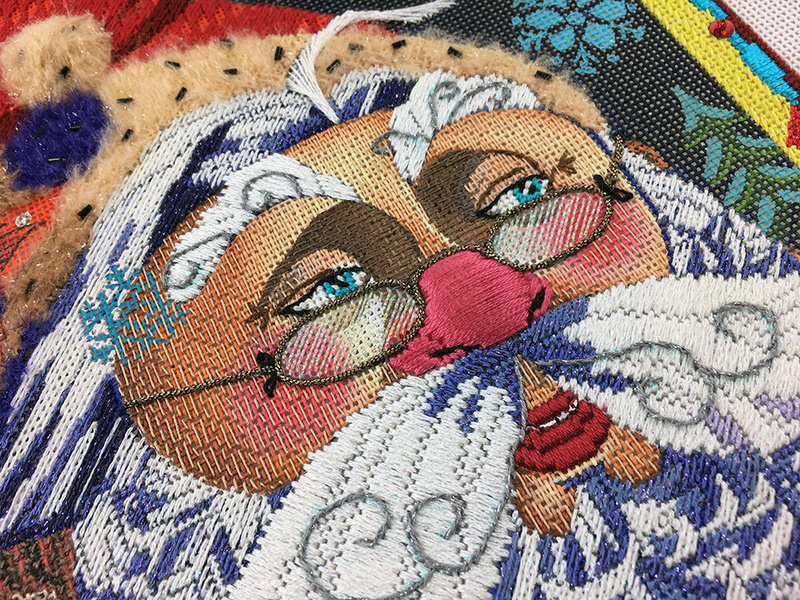 First part of the project was adding in the wonderful curls on Santa’s mustache and eyebrows. They are Outline Stitch worked over the previous stitching. You can either freehand them or you can draw them in with a vanishing marker. That’s what I did. See the little hints of light blue? I haven’t erased them yet. The main focus was getting his Santa suit just right. I designed a new stitch for the fabric. It moves quickly. Yay! You know I like that in a stitch, and I like that it looks like a fancy knitted pattern. So, here’s the challenge. How do we stitch a pattern on the suit and still keep all the strong shading that is so important to the art? We are taught not to break our stitches over a color change, right? 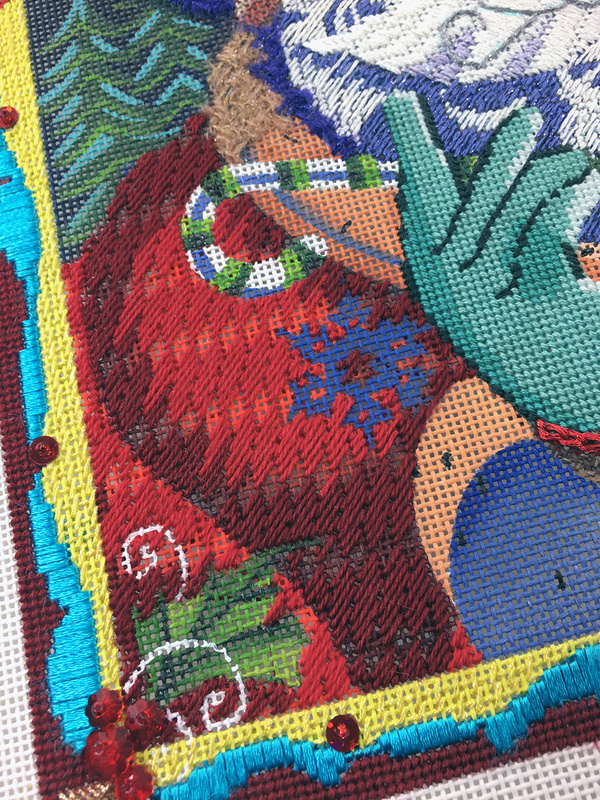 If a stitch will cover two different shades in a area we need to pick just one shade and go for it. This is what usually works. It creates soft transitions of color and doesn’t draw your eye unnecessarily to an area. That works great for the edges of his coat and hat. But what about the really bold shadow under the tip of his hat? To create that shadow, we need to break the rules and break the stitches. By doing that, the shadow has the depth that the artist wanted! Yay! A plan comes together. I fall in love with canvases because of the art. I want to keep that art as true as possible. I love stitches but I don’t want the stitches to interfere with the beauty of the painting. And talk about beauty! Look at this little girl. Abby came to visit yesterday. She is 4 months old and a doll. 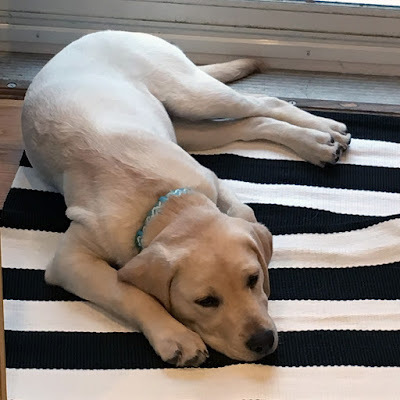 She’s learning to be very good. With a little bribery she has “sit” down to a science. 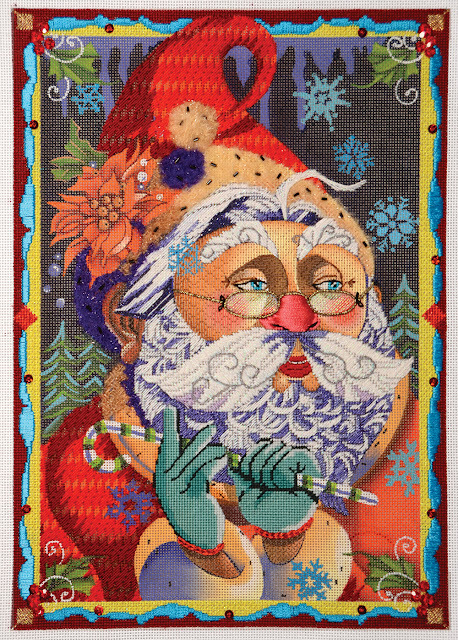 We finish Santa in the new year. Four weeks until class! In the meantime, I am hoping Santa brings me goodies for Santa Fe Felines and Why Fit In so that they can ship to you. P.S. If you would like to stitch Santa, here’s the link. « Previous Mystery Post: What to do? What to do?